It makes you proud when being so far away from home, suddenly people start saying only superlatives about your country. 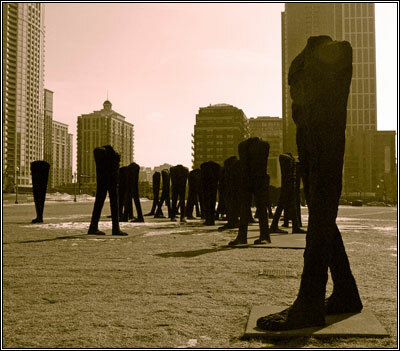 Such a situation happened to me last November, when Mrs. Magdalena Abakanowicz was opening her new installation in Grant Park in Chicago. This event has been prepared for two years and all regarding it ceremonies lasted the entire November. First, on November 16th was opened the installation "Agora" of Ms. Abakanowicz, then she was invited to give a lecture in the Art Institute of Chicago, and finally she had been awarded by The Paderewski Association the Maestro. "Agora" is the installation of 106 cast-iron and 9 foot tall figure sculptures. Each one is a fragment without heads and arms. Theirs sameness and equal height are the metaphor of forest and suggest its anonymity, even though they have particularizing differences in surface. "Agora" is the name for the marketplace or square where the popular political assembly met in ancient Greece. Thus her installation has mythic figures with one or the other foot thrust forward as if walking. They face in all directions, forming thickening and thinning crowds as one move from south to north. Four figures also stand in different places apart from the groups and symbolically outside of the thinking-group that has led the artist to describe crowds as "Brainless organisms acting on command, worshipping on command and hating on command." Maybe that was her past which encouraged her to create such a work? She was born into an aristocratic family in Poland. She came through Nazism and then Soviet occupation. The disposition of the figures has changed entirely since a computerized rendering of 20 months ago. The artist sited each component for maximum effect, creating passageways for viewers, who are meant to move among them, as well as complex patterns of light and shade plus a composition. Abakanowicz said she named this installation the Greek word, pointing out that the Agora of ancient Athens was where art, theater and philosophy began. She said she hoped visitors will walk through the installation dreaming and reflecting because "Every crowd is like a headless organism." Further she said "People must approach these with their imagination. Each sculpture is different because they are hand-molded. The texture made to resemble the bark of tree trunks. No two pieces are alike because, according to her words: "Nature never repeats twice." The sculptures look like shells, or the front of a sarcophagus. Abakanowicz described them as the discarded skin of a snake. Everybody should feel free to understand them like he wants to. This $3.5 million worth work is a gift from the artist and the Polish Ministry of Culture. Park officials have raised about two thirds of the more than $800,000 needed for installation and maintenance of the sculptures with money from corporate and private donors, including actor and Abakanowicz friend Robin Williams. A bitter irony is fact that, though this internationally known artist who had numbers of exhibitions all around the world and who's first comprehensive American retrospective took place in 1982 in Chicago also received voices of critics, and only one she got, unfortunately came up from the Polish community. Shortly, we should think about it!